To Cite: Shi K, Jing-Chun Z, Chun-Jing X, Jia-Ao Y. 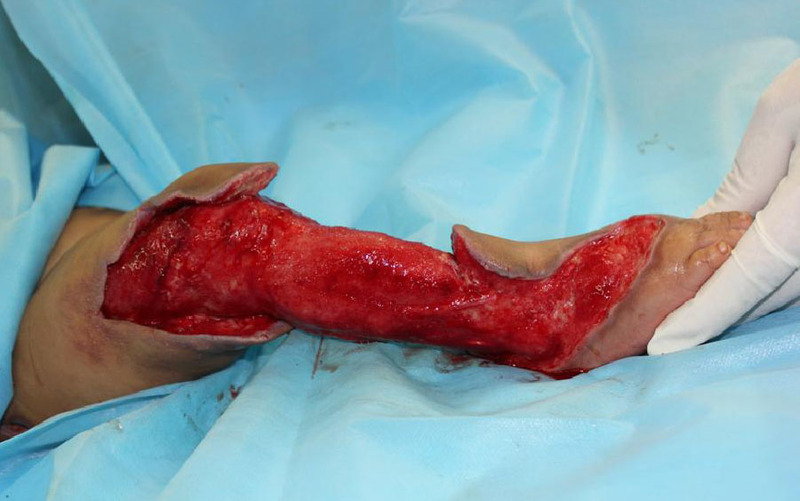 Severe Multiple Necrotizing Fasciitis Complicated by Abdominal Compartment Syndrome in an Infant, Iran J Pediatr. 2013 ; 23(5):601-603. Fig. 1: The necrotic tissue in both legs (circumferential) and hypogastrium (arrows). Both lower limbs including feet were severely swollen. and cyanosis of the lips and extremities further appeared, and retractions in the suprasternal, supraclavicular and intercostal spaces were noticed. Therefore, the infant was transferred to our department for a definitive treatment. Abdominal ultrasound revealed gas accumulation in the gastrointestinal tract and minimum fluid. Meanwhile following hospitalization, erythema and swelling of the legs was found to be rapidly progressing (Fig. 1). Fasciectomy and extensive surgical debridement of the two legs, hypogastrium and bilateral iliac regions was performed immediately and hand- made NPWT was applied simultaneously (Fig. 2). Pressure was applied at -50 mmHg continuously for the duration of therapy. urinary catheter was inserted only following adequate general anesthesia in the operating room. Reconstruction of wounds of the infant is more challenging because of special characteristics. Although numerous studies of NPWT have been published regarding outcomes and methods of therapy used for managing difficult-to-treat pediatric wounds or as an effective adjunct to expedite granulation tissue in wound preparation, no report on combined usage of NPWT with STSG in infants has been found. Wound size of this infant was extensive and across the knee joint. There is also difficulty in immobilization in infants following skin grafting. Due to these reasons, we adopted NPWT that can provide continuous adequate pressure to the recipient site of the skin graft to obtain a higher take rate, and to accelerate the epithelialization of the "blank space" following meshed STSG. Our report highlights the importance of early diagnosis, treatment with modern techniques including negative pressure therapy, prompt surgical debridement, appropriate antibiotics and aggressive supportive care in successful management and improved survival and cosmetic outcome in children with NF, even those complicated with ACS. However, we also know that it is hard to draw any convincing evidence from a single case and therefore, further research is required to verify the effect of NPWT in management of NF before wide acceptance of this method.